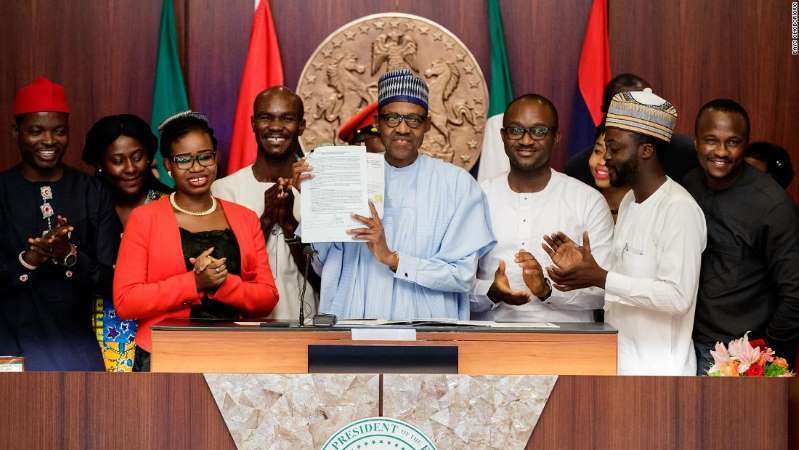 © Bayo Omoboriowo Members of the NotTooYoungToRun movement with Nigeria's President Muhammadu Buhari after he signed the #NotTooYoungToRun bill into law at the Presidential Villa in Abuja, Nigeria's capital city on May 31, 2018. More than 60 percent of Nigeria's population of 190 million people is aged below 25. Yet the current make up of Nigeria's parliament does not reflect this. The country has been led by older men, some of who have been in power consecutively for decades. Nigeria's 75-year-old President Muhammadu Buhari, elected in 2015, first had a taste of power through a military coup in 1984. This has inspired calls for younger leaders "rooted in the idea that Nigeria has been under the leadership of the same set of people since independence and it is they who have presided over the ongoing decline [of the country]," Rotimi Fawole, a Nigerian lawyer and social commentator told CNN. As Nigerians head to the polls in February 2019 in what will be a decisive election season, a generation of young aspirants are courting unprecedented positions. Among them is 39-year-old Chika Ukaegbu, a New-York based tech entrepreneur, Adamu Garba, 35, CEO of an IT company and Eunice Atuejide, a 39-year-old lawyer. Four years ago, neither of these candidates would have been able to contest. Nigeria's constitution, established upon the country's transition from military rule to a democratic government, requires presidential election candidates to be at least 40 years old. In 2016, a coalition of young activists led a campaign for a constitutional amendment to reduce age limits for contesting elective positions. Their efforts were streamlined into the Age Reduction Bill, which became known as the Not Too Young To Run Bill. The activists had first made an attempt years ago that ultimately fell short. "The efforts were "shut down very quickly," Chioma Agwuegbo, head of communications for the coalition's strategy team told CNN. 2016 was more welcoming. The partners outlined a new approach bolstered by "a lot more conversation around young people taking ownership of governance in their countries," said Agwuegbo. The youth's strength in numbers made an impact. In May 2017, President Buhari signed the bill into law in the Council Chamber. The significance of that moment is not lost on the young candidates vying for Nigeria's highest political seat. "Had the bill failed or had the president refused assent, I wouldn't have been legally qualified to run for the office of the president of the federal republic," Ukaegbu told CNN. The constitutional amendment has created a platform for young aspirants to offer the promise of a necessary departure from what Atuejide describes as a "caliber of old leaders who are very analog by nature." However, for all their potential, being young will not be enough. There are fears that their youth and relative inexperience will make it hard to advance in Nigeria's political landscape. With no clear distinction in policy, political aspirants often resort to what observers have described as "money politics". In recent years, political campaigns have featured food items branded with candidates' names and party logos and distributed in low-income areas. In audited reports filed to Nigeria's electoral body in May 2018, the two biggest parties, the ruling All Progressives Congress and the People's Democratic Party claimed that they spent 2.9 billion Nigerian nairas ($7.9 million) and 4.8 billion naira ($13.2 million) respectively in the 2015 elections. Such spending power is often unachievable for younger candidates. And that's only a part of the challenge. "They might also have cultural hurdles to surmount, with our societies being mostly gerontocratic," Fawole adds. "There's also the belief amongst many that the structures (security, finance, inter-parliamentary tensions) of Nigeria can't be controlled by an outsider. That largely remains to be seen." The candidates are receiving help from the 'Not Too Young To Run' coalition to defeat these obstacles. The coalition has launched another platform called 'Ready To Run' asking political parties to give young candidates a seat at the table and reduce the burden of expensive election forms. "These forms actually come from INEC for free. These parties sell them," Agwuegbo said. "APC has just announced that they're going to have direct primaries, so we're asking the other parties, perhaps you want to think about direct primaries as well," he said. While the coalition advocates their case, these young candidates are trusting innovation and online platforms to get them to the finish line. Atuejide has set up a call for donations on her website and on a number of fundraising platforms "in the hopes that Nigerians all over the world will start donating their stipends to my campaign." At 47, journalist and presidential hopeful Omoyele Sowore is not a direct beneficiary of the Age Reduction Bill. "For me, running in these elections is completely to disrupt the political process." So far, he has raised $63, 000 dollars on his GoFundMe page, "hosted 60 events," and "crowdsourced information from people in terms of what they want, that has clearly helped to define our political agenda and manifesto," he said. Even if election attempts are unsuccessful, there are hopes that these younger leaders may inspire others. "If they can run issues-based campaigns, be pragmatic and not necessarily play to the gallery," they can "show the older guys that a different way is possible," Fawole told CNN. "The greater the number of young people running, the greater the pressure it exerts on the old camp and the greater the chances of one of them being elected."